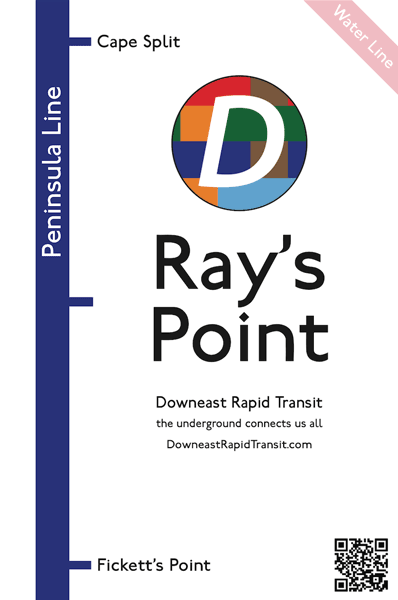 Downeast Rapid Transit (“DRT”) is a public art project that aims to build connections and stimulate meaningful conversation by imagining universally inclusive, accessible, affordable, safe, reliable, carbon-neutral and beautiful underground rapid transit service for all residents, neighbors, and visitors in coastal Washington County, Maine. In 2015, subway stations began sprouting up from Ellsworth to Lubec, from Steuben to Beddington, weaving together widely scattered communities with an invisible thread of imagined possibilities. Each station is a light-hearted portal to the underground, a point of entry into the web of deep connections that bind us together in our shared journey through the Cosmos. Every subway system needs stations, and every station needs a Stationmaster. In fact, the community of volunteer Stationmasters is the heart of the entire DRT system. This is where you come in. As a Stationmaster, you post an official sign on your property to mark the entrance to your imaginary station. Before long you’ll find yourself making new connections and engaging in lively conversations with friends and strangers on vital topics: the economics of public transportation in rural Maine; social isolation and connectedness; the boundary between imagination and reality; the role of art in society; and whether or not you really can get there from here. Who can be a Stationmaster? you are willing to serve as a goodwill ambassador to your fellow travelers. If you're interested, please contact me. If you ever have problems with your sign (damage, theft, neighbor complaints, etc.) please let me know and we'll work together to sort it out. If you change your mind and decide that being a Stationmaster isn't for you after all, you are free to resign at any time. Just let me know. Your station sign is a one-of-a-kind signed piece, customized to your station. It is yours to keep. attaches easily to just about any surface — wood siding, 4x4 wood post, metal fence post, etc. use, promote, and develop your station as you please, in keeping with the spirit of DRT. Some Stationmasters add benches and parking areas; others add dispensers for free postcards. Want to install a ticket booth, vending machine, or dirigible docking mast? Go right ahead! It's your station. DRT also oversees the Water Line — a fleet of independently owned and operated recreational and commerical boats that provide imaginary ferry and shuttle service along the coastal waterways of Washington County. Water Line boat captains enjoy the same responsibilities and rewards as Stationmasters, with one crucial difference: boats! Instead of a metal station sign, Water Line captains receive a grommeted nautical cloth flag emblazoned with the DRT Water Line logo. The skipper's name, the boat's name, and the vessel type (sailboat, fishing vessel, motor boat, canoe, etc.) will be listed on the DRT website. Downeast Rapid Transit is funded solely by the artist. Contributions to help offset my costs (printing, sign fabrication, website hosting, mileage, etc.) are always welcome.